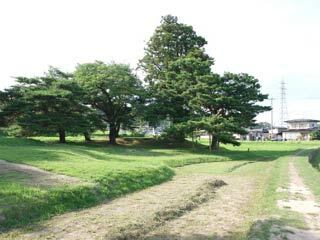 The historical spots related to Genpei War which happened between Taira clan and Genji clan from 1180 to 1185. Muryokoin Temple (無量光院) was constructed by Hidehira, the 3rd lord of Oshu Fujiwara. In the 12th century, it was a beautiful temple and almost entirely a copy of Uji's Byodoin, theh location of the famous Phoenix Hall in Uji, Kyoto. Today, the temple was lost, but the ruins of beautiful garden remains. There is a parking. No restroom.